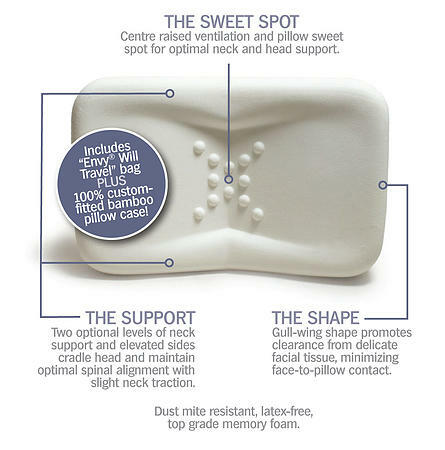 The enVy Pillow is made of ergonomically shaped LuxFeel memory foam (with 2 built in neck supports). This Canadian made State-of-the-Art LuxFeel Memory Foam is anti-microbial, dustmite resistant and hypoallergenic and DOES NOT become firm even when temperatures are sub-freezing! It comes with A Custom Fitted 100% Bamboo Pillow Case and a luxurious satin draw string travel bag.